HIM facts, tips, and tidbits from our team of experts to yours. There are so many reasons that you should be auditing this year but we have our Top 6 that we believe are most important. New and revised codes in both coding systems effective Oct 1st, 2016 and Jan 1st, 2017. Check out the Top 6 details here! CMS releases 2018 ICD-10-CM codes for October 1 implementation. Starting October 1, you’ll be able to select a specific ICD-10-CM code when a patient is in remission from abuse of each of a variety of substances, including alcohol, opioids, cannabis and nicotine. Those nine new codes are among 360 new, 142 deleted and 226 revised diagnosis codes in the final 2018 update posted to CMS’ website June 13. The final 2018 ICD-10-CM codes include 322 more changes than what was released in the 2018 IPPS proposed rule in April. Explanatory information included with the substance abuse remission codes will classify the severity of the use as mild, moderate, or severe to better coordinate ICD-10-CM coding with the American Psychiatric Association’s Diagnostic and Statistical Manual of Mental Disorders (DSM-5). Heart failure gets new codes. The code set has new codes for various types of right heart failure, including acute (I50.811), chronic (I50.812), acute on chronic (I50.813), and unspecified (I50.810). You’ll also have new codes to report for right heart failure due to left heart failure (I50.814), biventricular heart failure (I50.82), high-output heart failure (I50.83) and end-stage heart failure (I50.84) for patients with an advanced form of the disease who no longer respond to medication. Antenatal screening codes expand reporting options. Practices will be able to report specific screening tests administered to pregnant patients, such as fetal growth retardation and chromosomal abnormalities with 17 new Z-series codes. Non-procreative genetic counseling visits will be coded with Z71.83. The final code set includes more than 100 deletions that were not in the proposed code set, including a reversal on new codes. The head injury section of Chapter 19 will lose 68 subsequent encounter and sequela codes. One example is S06.2X7D (diffuse traumatic brain injury with loss of consciousness of any duration with death due to brain injury prior to regaining consciousness, subsequent encounter). Because the code indicates the patient died, the concept of follow-up care did not make sense for the codes. Deletion of 36 thumb subluxation and dislocation codes. The codes represent initial and subsequent encounters, as well as sequela. HCC (hierarchical condition category) coding is hot right now in this new world of value-based and risk adjustment payment models. HRG coders are skilled HCC coders and are familiar with the challenges to accurate HCC reporting. Preventive services include their initial Welcome to Medicare, Initial and Subsequent Annual Wellness Exams (the name is a bit misleading, as this is mostly paperwork and planning), as well as many screening tests and counseling options. **Quick note: “Screening” implies that the patient has not already been diagnosed with this condition. As of January, 2017, reimbursement for Moderate Sedation (aka Conscious Sedation) has been unbundled. There are new codes with new descriptions and guidelines. The requirements for this sedation billing includes the pre-service, intra-service and post-service work. However, it is the intra-service work that drives the time-based code selection. Comments were due April 7, 2017 for the proposed new ICD-10 CM (diagnosis) and ICD-10-PCD (procedures) codes for the 2018 and 2019 fiscal years. Types of myocardial infarctions (MI) and heart failure classifications where two subjects with new proposed codes including “a new subcategory is proposed for right heart failure (I50.84). New codes have been proposed for biventricular failure (I50.82), high-output heart failure (I50.83), end-stage heart failure (I50.84), and other heart failure (I50.89). These new codes will provide more information regarding the patient’s severity of illness,” Laurie Johnson, MS, RHIA, CPC-H, FAHIMA, AHIMA-Approved ICD-10-CM/PCS Trainer. 100% of our coding and HIM leadership team are ICD-10 profecient and ready to help! 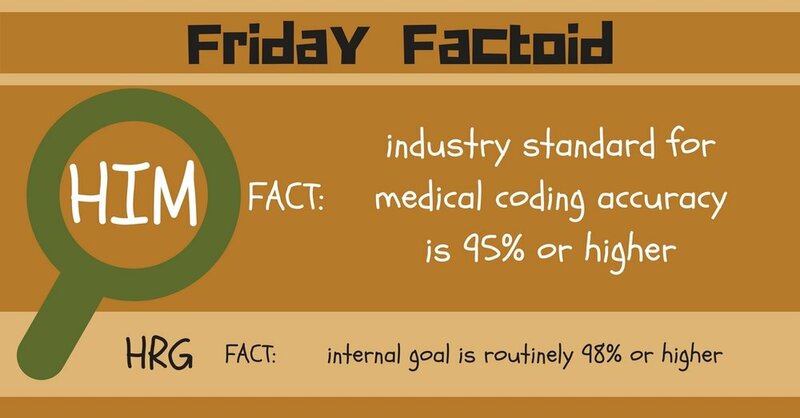 Industry standard for medical coding accuracy is 95% or higher. Internal goal is routinely 98% or higher!